*Cook's Note: A mixture of Crispin, Granny Smith, and Cortland is nice if you can. Special equipment: Mandolin for slicing, and a pastry brush. Prepare one 2-crust batch of your favorite all butter pie crust. Roll the bottom crust to fit a 9-inch pan, and cut the top crust as a lattice, approximately 1-inch in width or as desired. Chill the rolled crust while you prepare the salted caramel and apple filling. Cook's Note: This process can take awhile depending on the heat source. Keep an eye on it, if the caramel begins to smoke, you've burned it and you'll have to start over. Once the mixture has turned a copper color, remove it from the heat and immediately add the heavy cream - the mixture will bubble rapidly and steam - be cautious as the sugar will be very hot. Juice the lemons into a large mixing bowl. Core, peel, and thinly slice the whole apples. Cook's Note: A mandolin works great for producing very thin slices. In a large measuring cup or small mixing bowl, combine the sugar, flour, cinnamon, allspice, nutmeg, and Angostura bitters. Sprinkle this mixture over the apples in the mixing bowl. Use your hands to gently mix and coat the apple slices. 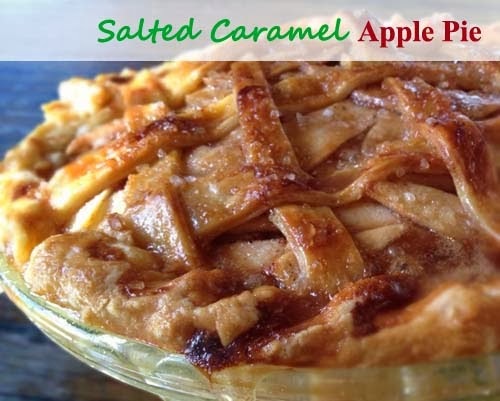 Gather your rolled pie crust, salted caramel, and apple mixture. Begin by layering 1/3 of the apples in the bottom of the crust so that there are minimal gaps. Pour 1/3 of the caramel over the apples. Add 1/3 of the apples and caramel for a second layer, and then add a third layer of apples, and then the caramel again. Cook's Note: Save a small portion of the caramel to pour on top once the lattice is assembled. The recipe and instructions are from http://www.cookingchanneltv.com/recipes/four-and-twenty-blackbirds-salted-caramel-apple-pie.html. Should be fun for Thanksgiving and Christmas parties.